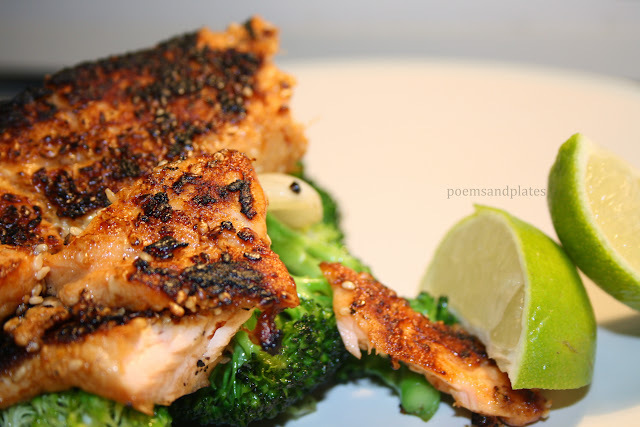 Let me talk to you about Sesame Salmon with Lime Broccoli & Spring Onions, though. This is one of those dishes that will fill your entire house with its aroma. Before I even began making it, I wanted to eat it. I had just combined two of the three ingredients in the marinade and was already fantasizing about raising fork to mouth and indulging in that flaky coral salmon. Begin by combining the freshly grated ginger with the soy sauce and (tbsp) sesame oil. Add the salmon to the dish, allowing the marinade to infuse and coat each side of the fish. Sprinkle the salmon one each side with the sesame seeds. Preheat a heavy frying pan. Add the salmon and cook for 3 to 4 minutes on each side. Meanwhile, heat the sunflower oil and remaining sesame oil in a wok, add broccoli and onions and stir fry for about 5 minutes. Season to taste with salt and pepper. Plate up and serve. Spritz with lime, ensuring that the broccoli gets flavored with the lime as well. Bizarrely, the tangy lime taste mixed with the slightly leafy, bitter taste of the broccoli really works and is phenomenal. The best thing about this dish is the tender salmon, the slight crunch of lightly toasted sesame seeds, the munch of al dente broccoli and spring onions, swimming in the tart spritz of lime.